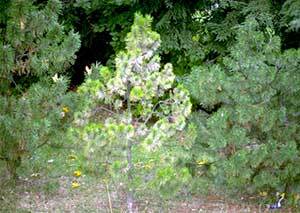 Many pine (Pinus) species but mostly mugo (P. mugo) and Scots (P. sylvestris) pines in the Northeast. 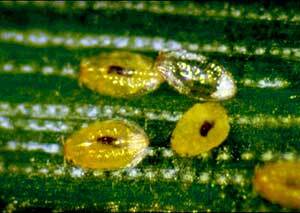 The white, waxy scale covering of this pest is very obvious when present on the needles of the host plant. 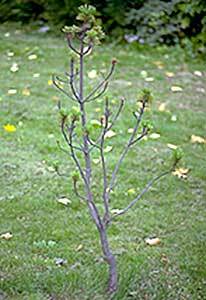 Small infestations can increase to large populations within one growing season and cause extensive needle, branch and, sometimes, tree mortality. This pest is primarily a problem in the landscape and nursery and is rarely found in the forest setting. It is a common and potentially serious pest. Red-colored eggs over-winter under the scale covering of the dead female on the needles of the host plant. These hatch in late-May/early June, in Massachusetts. The new crawlers emerge from under the scale covering of the parent scale and crawl a short distance or are windblown. Those that land on a suitable host plant will quickly settle down, insert their piercing-sucking mouthparts into the mesophyll and begin producing their own waxy covering over their bodies. Females will never develop legs, wings, eyes or antennae while the male will. Females never leave their waxy coverings. Males will mature and gain the features associated with the typical adult insect body. Upon emergence, adult males will mate with females through their waxy coverings. After mating, the males die and females will produce eggs and then die. There are two generations per year and the second emergence of crawlers appears in late-July into early August, in Massachusetts. 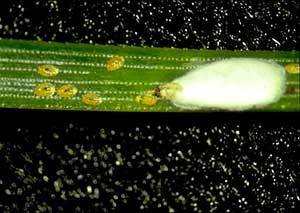 Each female produces upwards to 100 eggs, which accounts for this pest's ability to create severe injury within one growing season. GDD: 448 and again at 1917, for the crawlers. 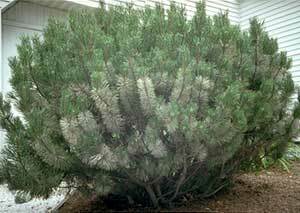 As with most scale species, horticultural oils are the best option for management. These oils are effective at killing all life stages, including the eggs. Chemical pesticides can be applied for the crawler stage but timing is essential. New crawlers form a waxy covering rather quickly and may be protected from these chemicals.